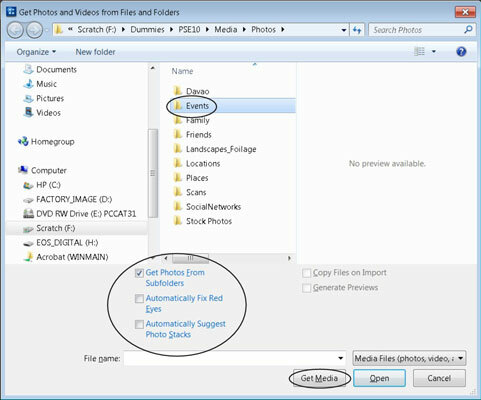 To work with files in Photoshop Elements 11, you need to get them from folders on your computer’s hard drive. You might have a folder from a media device or a folder with copied cell phone images. Copy files to a folder. You can organize photos into separate folders on your hard drive, nest folders, or copy a bunch of photos to a single folder. When you use multiple folders, you repeat the steps here to import each folder’s images into the Organizer. If you nest folders, you can get files from a parent folder and all subfolders. Choose File→Get Photos and Videos→From Files and Folders. You can import a single file or a collection of images with this command. When you choose the menu command, the Get Photos and Videos from Files and Folders dialog box opens. If you want to import all photos within a given folder, click any file in the list and then press Ctrl+A (Command+A on a Mac) to select all. Alternatively, you can click and Ctrl-click (Command-click) to select files individually in a noncontiguous order or click and Shift-click to select photos in a contiguous order. Specify your Fix Red Eyes and Photo Stacks options. We recommend leaving the other options, such as fixing red-eye and suggesting photo stacks, at the defaults where the check boxes are deselected. You have much better editing options in Elements, so don’t use the automated features in the Get Photos and Videos from Files and Folders dialog box. Click the Get Media button. Wait for Elements to complete the import process. Your photos appear in a new Organizer window, and you’re ready to apply edits in either the Organizer or an Editor. When you import photos, only those photos you imported are shown as thumbnails in the Organizer. To see all photos you imported from previous sessions as well as the new import, click the Show All button at the top of the Media Browser window.